It was too cold this weekend. We had to battle wind chills of -20! 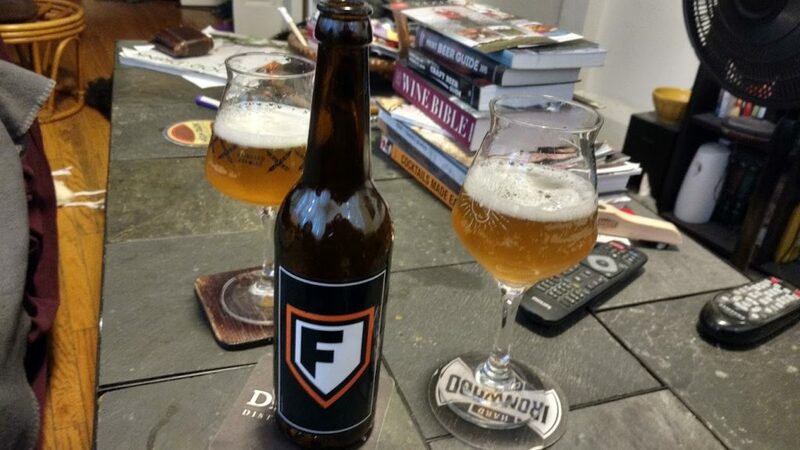 What better way to warm up than with a 9% peach flavoured fruit beer (or is it a saison?). This thing is funky, interesting and as far as I can tell, gone from the world. I took a look around and every bar I knew that had it is out and the brewpub itself seems to be dry. We had this beer at Landsdown Brewery on New Years Eve but made sure to have a bottle for our own proper review. I uh, wasn’t at the greatest level of sobriety to be reviewing beer that night. Bad Grammar is not available at the LCBO and it sits at 9% ABV. Appearance: Hard White head that fades fast. Straw coloured. Aroma: Peaches and cream, bubblegum, juicy fruit. Taste: Peach, very little bitterness, mango that’s overripe. Sour comes in here and a lot of funk. Reminds me of under ripe peaches. Overall: Unique for sure, sour and out there.